Please Don't Eat Me! Go Vegan? 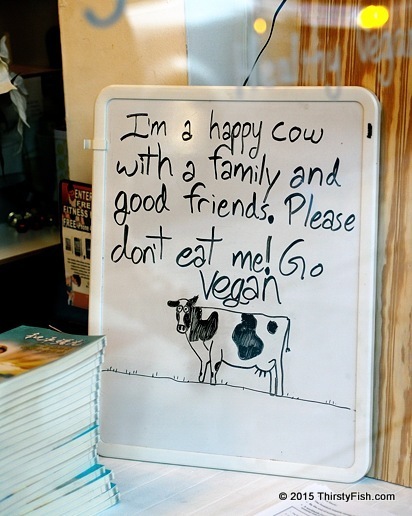 Vegetarianism and veganism can be touchy subjects these days. Although the term vegetarian was coined in 1839, and vegan in 1944 - both in England - the practices of abstaining from eating meat and using animal products have been around for thousand of years in different cultures. Vegetarians and vegans cite religious, ethical, cultural, environmental, animal rights and health reasons for their choice. There are pro and con arguments out there for all these cited reasons. You might find some of the points made by Lierre Keith in The Vegetarian Myth to be interesting. What you eat and the principles by which you live, should be a personal choice. But we shouldn't forget that, for the over 80 percent of the world population who live on less than $10 a day, what they eat and how they live is not really a choice. I deeply respect the "sanctity of all sentient life" conviction held by most vegetarians and vegans. But those who believe that their personal choice is going to contribute to a global "paradigm shift" towards sanctity of life are mistaken. Humanity is way past the point where life is regarded to be sacred. Species are becoming extinct at rates 1,000 times faster because of humans. And, we're entering a new age - if we haven't already done so - where we will be struggling for our very own existence. Personal choices such as veganism, lower carbon footprint, shorter showers, and the like, simply won't be enough to reverse the systemic momentum toward the destruction of most life on earth. Life has long been desacralized and commodified.